X Son corps est si puissant qu’il lui faut une ceinture de force pour équilibrer ses mouvements. X Su musculoso cuerpo es tan fuerte que usa un cinto antifuerza para controlar sus movimientos. X Il suo corpo muscoloso è così forte che usa una cintura antiforza per regolare i suoi movimenti. X 엄청나게 강한 육체를 지녔기 때문에 파워 세이브 벨트를 차서 힘을 제어하고 있다. Y Il peut soulever un camion d’une main. Il se sert de sa force pour aider dans les tâches physiques. Y Puede levantar un gran camión con una mano. Utiliza su fuerza para ayudar a la gente. Y È così forte da sollevare un autocarro con una sola mano. Aiuta le persone nei lavori pesanti. Y 한 손으로 덤프트럭을 들어 올린다. 파워를 살려서 사람 대신 힘쓰는 일을 돕는 포켓몬이다. 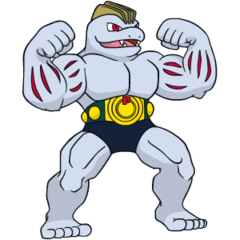 Omega Ruby Machoke undertakes bodybuilding every day even as it helps people with tough, physically demanding labor. On its days off, this Pokémon heads to the fields and mountains to exercise and train. Omega Ruby Maschock stählt seinen Körper jeden Tag, zum Beispiel indem es Menschen bei einer harten körperlichen Arbeit hilft. An seinen freien Tagen begibt es sich auf Felder und Berge, um zu trainieren. Omega Ruby Machopeur pratique le body-building tous les jours, même lorsqu’il aide les gens à réaliser de durs travaux. Pendant ses congés, ce Pokémon va s’entraîner dans les champs et les montagnes. Omega Ruby Machoke realiza sesiones de culturismo todos los días. De entrenamiento le sirven también las veces que ayuda a la gente en tareas de esfuerzo físico. En sus días libres, va al campo o a la montaña para hacer más ejercicio. Omega Ruby Machoke si allena ogni giorno con esercizi di body building, aiutando l’uomo nei lavori fisicamente pesanti. Nei giorni di riposo, si reca in campagna o in montagna per allenarsi ancora. Omega Ruby 힘이 많이 드는 인간의 일을 도와주며 매일 몸을 단련하는 포켓몬이다. 쉬는 날에는 산야에서 몸을 단련한다. Alpha Sapphire Machoke’s thoroughly toned muscles possess the hardness of steel. This Pokémon has so much strength, it can easily hold aloft a sumo wrestler on just one finger. Alpha Sapphire Maschocks starke Muskeln sind so hart wie Stahl. Dieses Pokémon hat so viel Kraft, dass es mit nur einem Finger einen Sumo-Ringer in der Luft halten kann. Alpha Sapphire Les muscles toniques de Machopeur sont durs comme de l’acier. Ce Pokémon est si fort qu’il peut facilement soulever un sumo avec un seul doigt. 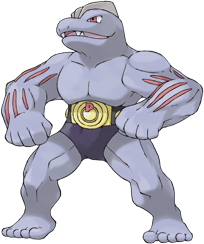 Alpha Sapphire Los entrenados músculos de Machoke son tan fuertes como el acero. Este Pokémon es tan fuerte que puede levantar con un solo dedo a un luchador de sumo. Alpha Sapphire I muscoli perfettamente tonici di Machoke possiedono la durezza dell’acciaio. Questo Pokémon è così forte da riuscire a sollevare un lottatore di sumo con un dito. Alpha Sapphire 잘 단련된 근육은 강철처럼 단단하다. 씨름 선수의 몸을 손가락 1개로 쉽게 들어 올릴 수 있는 괴력의 포켓몬이다. Sun As a result of its continual workouts, it has developed tremendous power. It uses that power to help people with their work. Moon It willingly assists with hard labor because it knows the work is good training for its muscles. Red Its muscular body is so powerful, it must wear a power save belt to be able to regulate its motion. Blue Its muscular body is so powerful, it must wear a power save belt to be able to regulate its motion. Yellow The belt around its waist holds back its energy. Without it, this Pokemon would be unstoppable. Stadium Although it is incredibly strong, it is always modest. It restrains its strength with a power-save belt. Gold It always goes at its full power, but this very tough and durable Pokemon never gets tired. Silver The muscles covering its body teem with power. Even when still, it exudes an amazing sense of strength. Stadium2 It always goes at its full power, but this very tough and durable Pokémon never gets tired. Ruby Machoke's thoroughly toned muscles possess the hardness of steel. This Pokemon has so much strength, it can easily hold aloft a sumo wrestler on just one finger. Sapphire MACHOKE undertakes bodybuilding every day even as it helps people with tough, physically demanding labor. On its days off, this POKeMON heads to the fields and mountains to exercise and train. Emerald A belt is worn by a MACHOKE to keep its overwhelming power under control. Because it is so dangerous, no one has ever removed the belt. Pearl It can lift a dump truck with one hand. Using that power, it helps people with heavy jobs. Platinum It happily carries heavy cargo to toughen up. It willingly does hard work for people. HeartGold It always goes at its full power, but this very tough and durable Pokémon never gets tired. White It happily carries heavy cargo to toughen up. It willingly does hard work for people. White 2 It happily carries heavy cargo to toughen up. It willingly does hard work for people.